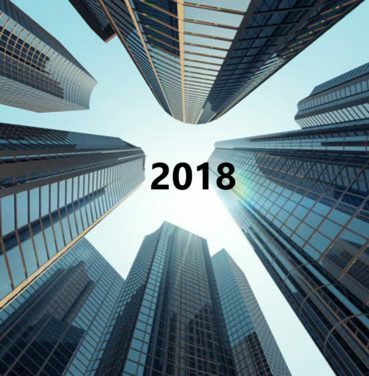 As we completed our move into one of Northamptonshire’s most iconic buildings – The Pyramid at Brixworth, we wanted to share with you how we are keeping the spirit and history of the pyramid alive whilst incorporating our brand into a new era for the premises. Mercedes Benz High Performance Engines built this unique and distinctive building in 1999 as a reward for the effort and to celebrate Mika Hakkinen winning the World F1 driver’s championship as well as McLaren winning the manufacturer’s championship. 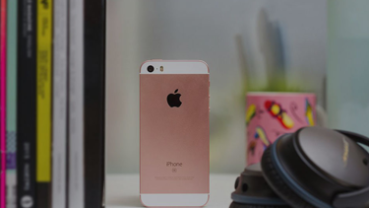 It was built to accommodate the entire company as a recreational facility (including a first class restaurant), board room, large & small meeting rooms and a large open chamber with projectors to watch the races. 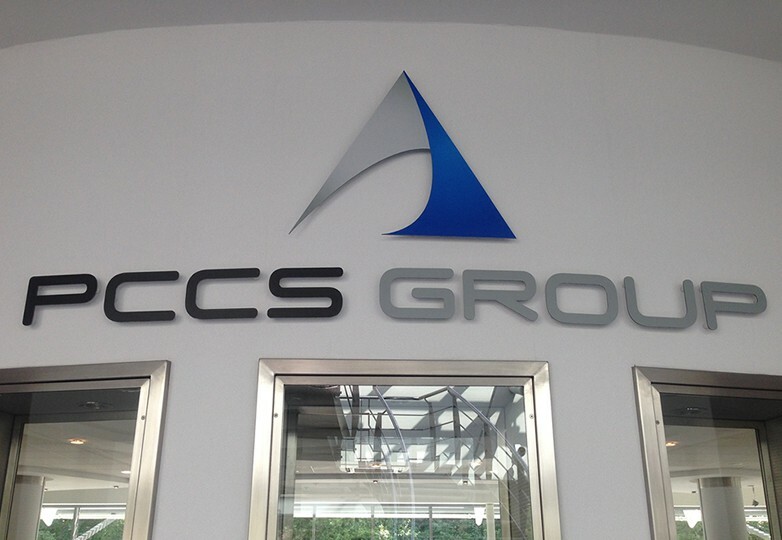 As we at PCCS Group develop software solutions for the after sales service industry, we have converted the central recreational facility into an open plan space for our development, support and marketing teams to work in an environment that encourages communication between the departments to ensure that everyone can get involved in the conversations around the development and sustainability of our flag ship software – Skyline and its associated platforms online. 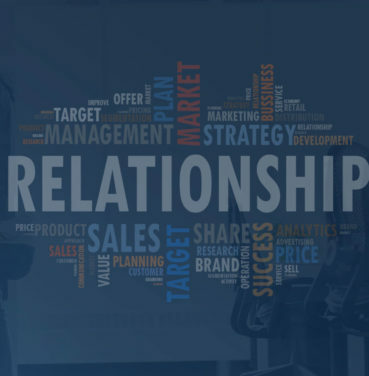 We believe everyone has their individual strengths that can be utilised in areas across our business, those strengths should be capitalised on at every touch point. 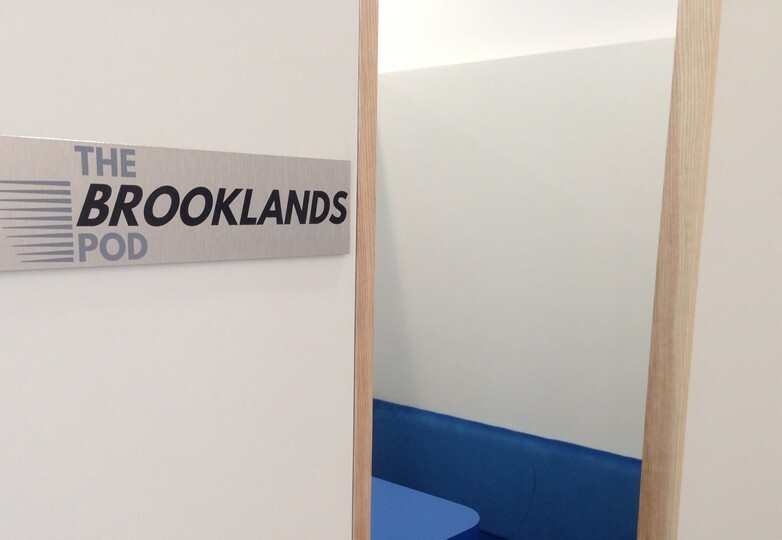 This new development/support open plan environment certainly encourages everyone to get involved in those conversations. 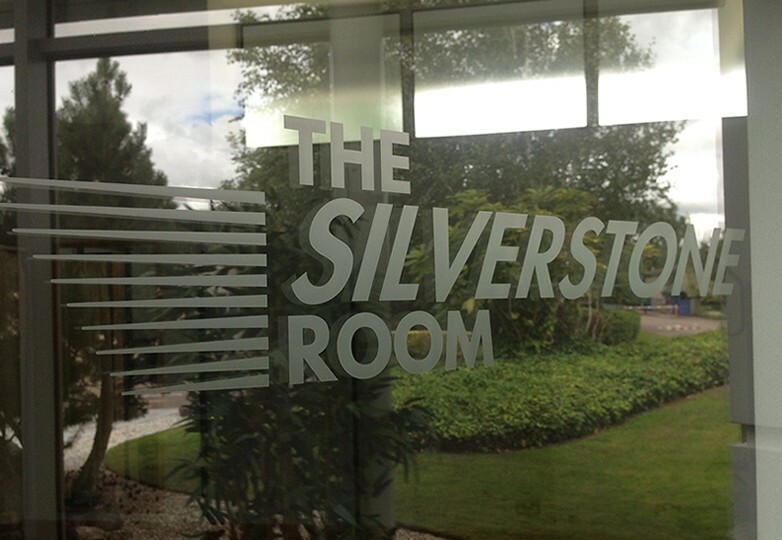 The legacy associated with this building is second-to-none, Formula 1 is an industry close to the heart of Northamptonshire being the home to many of the current F1 manufacturers, the leading engine provider and the home of the British GP. Some would argue the spiritual home of the most lucrative motorsport on the planet. 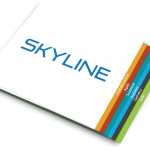 Without question, this was going to form part of our interior branding. 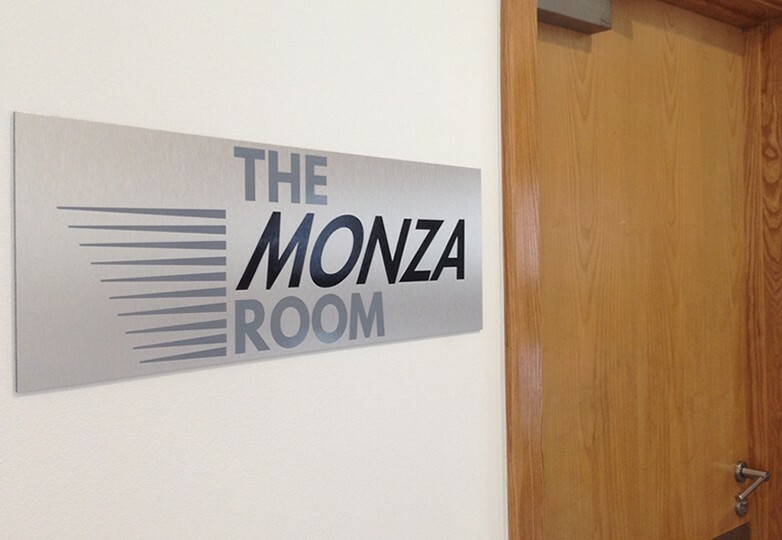 The Monza Room – a slightly larger meeting room, accessed via the central chamber and exterior side door. 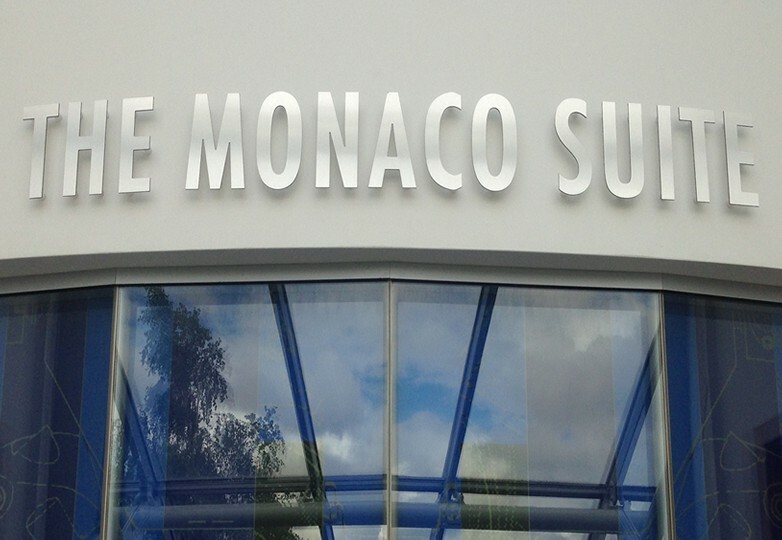 The Monaco Suite – Couldn’t be anything else but the swanky Boardroom that utilises the entire top level of the pyramid. 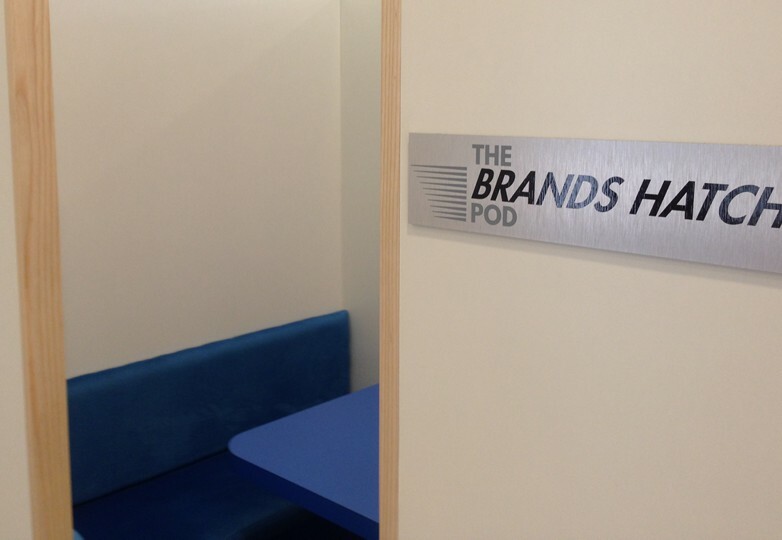 The Brooklands Pod and finally, The Brands Hatch Pod – These meeting pods sit in the central chamber where silo teams can have meetings without having to leave the central chamber. 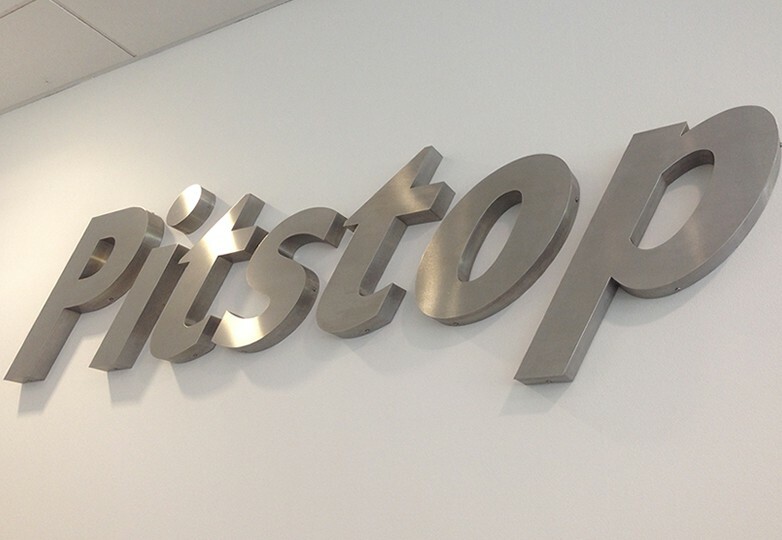 Also salvaging signage from the original owners, the PITSTOP sign hangs within the central chamber, just by our break room. 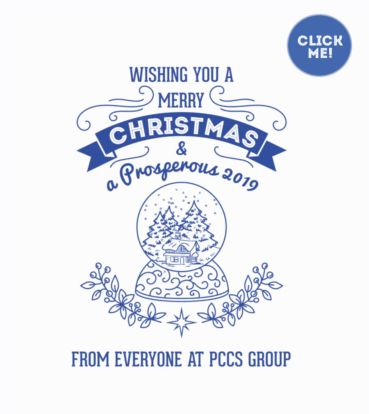 Whilst leveraging the legacy of this building, we have also erected a full colour PCCS Group logo in the foyer labelling the central chamber and each exterior door is labelled with a frosted PCCS Group logo. There are certainly no doubts over who is now operating out of this building. 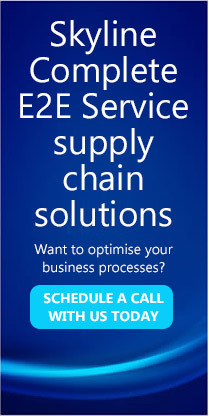 PCCS Group is a specialist E2E service supply chain solutions provider that designs, writes, and implements software solutions specifically designed to provide insight and innovation to the service and support sectors through enterprise software and collaboration. 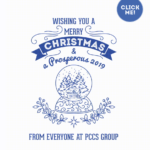 PCCS Group has a range of flexible and scalable software, which in close collaboration with its client’s ensures its core code can be adapted to meet their specific business requirements, including the operational delivery. Significant investment in cloud-based data center configuration ensures 99.99% up-time with a safe pair of hands-on project migration, The group’s scope ensures our clients are engaged with more than just a software company and are building long-term sustainable service solutions and partnerships.